For the Irish politician, see Matthew Stafford (politician). John Matthew Stafford (born February 7, 1988) is an American football quarterback for the Detroit Lions of the National Football League (NFL). He was raised in Dallas, Texas, and went to Highland Park High School. He attended the University of Georgia, where he played football for the Bulldogs, and was drafted by the Lions first overall in the 2009 NFL Draft. Stafford is the fourth quarterback in NFL history to throw for over 5,000 yards in a single season, being one of three players to do it in 2011, and is the fastest player in NFL history to reach 30,000 yards in (109 games). Stafford also holds the NFL record for the most comeback wins in a season, recording eight in the 2016 NFL season. In 2017, he signed a $135-million contract extension with the Lions, making him the highest-paid player in NFL history at the time. Stafford was born in Tampa, Florida, to John and Margaret Stafford. He lived in Dunwoody, Georgia, while his father attended graduate school at the University of Georgia. He was the eldest of five siblings. His family then moved to Dallas, Texas, and Stafford attended Highland Park High School with Los Angeles Dodgers pitcher Clayton Kershaw. He was coached by Randy Allen and was widely considered to be one of the best high school quarterbacks in the United States in the Class of 2006, ranked ahead of Tim Tebow. In 2005, he led his team to a perfect 15–0 record and won the UIL 4A Division I State Championship. During the playoff run, Stafford beat Ryan Mallett's Texarkana Texas 38–31, as well as Jevan Snead's Stephenville 41–38. Stafford had over 4,000 yards passing despite not playing in the first three games of the season due to a knee injury. Stafford received numerous accolades, including being named to the Parade All-America Team and the USA Today Pre-Season Super 25 in 2005. He also won the MVP and Best Arm awards at the 2005 EA Sports Elite 11 Quarterback Camp and was named the 2005 EA Sports National Player of the Year. Regarded as a five-star recruit by Rivals.com, Stafford was listed as the No. 1 pro-style quarterback prospect in the class of 2006 by Rivals.com. Before he had even started a game at the collegiate level, analyst Mel Kiper, Jr. predicted, correctly, that Stafford would eventually be the first pick in the NFL Draft. "Georgia Football Commitments". Rivals.com. Retrieved December 17, 2011. "2006 Georgia Football Commits". Scout.com. Retrieved December 17, 2011. "ESPN". ESPN.com. Retrieved December 17, 2011. "Scout.com Team Recruiting Rankings". Scout.com. Retrieved December 17, 2011. "2006 Team Ranking". Rivals.com. Retrieved December 17, 2011. — Football analyst Mel Kiper, Jr. on ESPN Radio in September 2006. Stafford graduated early from high school and enrolled at the University of Georgia in January, where he became the first true freshman quarterback to start for the Georgia Bulldogs football team since Quincy Carter in 1998, and first out of high school to start since Eric Zeier in 1991. Stafford wore number 7 at Georgia. He completed five of 12 passes for 102 yards and one touchdown in a Georgia spring game. Stafford debuted late in the season opener of the 2006 season against Western Kentucky and went 3 of 5 passing for 40 yards and a touchdown pass. During the season's third game, against South Carolina, starting quarterback Joe Tereshinski III was injured, forcing Stafford to come off the bench. Although he completed just 8 of 19 passes for 171 yards and three interceptions, Georgia won the game, 18–0. Against University of Alabama Birmingham the following week, Stafford made his first collegiate start. Georgia won, 34–0. Victories over Colorado and Mississippi improved Georgia's record to 5–0, but the heart of the conference schedule loomed. The rest of the season was up and down for Stafford and the Bulldogs. Following home losses to both Tennessee and Vanderbilt, UGA head coach Mark Richt named Stafford the starter for the rest of the season ahead of Tereshinski. Stafford completed 20 of 32 passes for 267 yards and two touchdowns in a 27–24 win over Mississippi State, and was named the SEC Freshmen of the Week for his efforts. Statistically, he had his best game of the season against the 5th-ranked Auburn Tigers. Stafford finished the game 14 of 20 for 219 yards and a touchdown, and added 83 rushing yards and a touchdown on 7 carries in Georgia's 37–15 upset win. The following week, Stafford led the Bulldogs on a 12-play, 64-yard drive and threw the game-winning touchdown pass in Georgia's 15–12 win over No. 16 Georgia Tech. Stafford completed his freshman season by leading Georgia to a 31–24 come-from-behind victory over Virginia Tech in the Chick-fil-A Bowl, after the Bulldogs trailed 21–3 at halftime. Stafford threw for 129 yards and a second half touchdown to spark the comeback and allow Georgia to finish the season with a 9–4 record. Stafford threw for 234 yards and two touchdowns as the Bulldogs defeated the Oklahoma State Cowboys 35–14 in the season opener. Against Alabama, the Bulldogs avoided an 0–2 start in SEC play by escaping Bryant–Denny Stadium with an overtime win. Stafford connected with senior wide receiver Mikey Henderson on the Bulldogs' first play from scrimmage in overtime for the winning score. In the win over No. 9 Florida, he completed 11 of 18 passes for 217 yards and three touchdowns, including a career-long touchdown pass of 84 yards to Mohamed Massaquoi and a 53-yard touchdown pass to Henderson. The wins over Florida, Auburn, and Georgia Tech marked the first time that Georgia had defeated all three rivals in the same season since 1982. Stafford had 175 yards passing and a touchdown pass during Georgia's 41–10 rout of the No. 10 Hawaii Warriors in the 2008 Sugar Bowl. He completed 194 of 348 passes for 2,523 yards (194.1/game) and 19 touchdowns as well as two rushing touchdowns for the season. Stafford helped lead Georgia to an 11–2 record, their best mark since the 2002 season. Stafford was chosen to Athlon’s preseason Heisman Favorites Others To Watch list. Georgia was ranked #1 in both the preseason coaches poll and the AP poll, marking the first time Georgia has ever been #1 in the preseason version of either poll. The preseason #1 ranking is prominently displayed in Sanford Stadium alongside all the other national titles they've won during the last 40 years. The team also entered the 2008 season with the longest active winning streak among the 66 BCS conference teams, having won its last 7 games of the 2007 season. In the final regular season game against Georgia Tech, Stafford completed 24 out of 39 attempts for 407 yards and 5 touchdowns, setting a personal record for touchdowns in a single game, albeit a 45–42 loss. Stafford finished the season with a conference-leading 3,459 passing yards, the second most in school history, and 25 touchdowns, the single-season record for passing touchdowns. He also rushed for a touchdown in 2008. Georgia finished the regular season with a 9–3 mark and qualified for the Capitol One Bowl. After defeating Michigan State 24–12 and winning the MVP of the 2009 Capital One Bowl, Stafford finished his three years at Georgia with a 3–0 record in bowl games and a 6–3 record in rivalry games (1–2 against Florida, 3–0 against Auburn, and 2–1 against Georgia Tech). Stafford chose to forgo his senior season and entered the 2009 NFL Draft. Named SEC Freshman of the Week twice during the 2006 season. Named Rivals.com's National Freshman of the Week for his performance against Auburn on November 11, 2006. Received the University of Georgia's 2006 Offensive Newcomer of the Year Award. Named to the 2006 SEC Coaches' All-Freshman Team. Named All-America in 2008 by Pro Football Weekly. Named to Second-team All-SEC in 2008. Stafford's 25 touchdown passes in 2008 broke the previous Georgia record of 24, set by D. J. Shockley (2005) and Eric Zeier (1993, 1994). Stafford's 3,459 yards passing in 2008 were 2nd most in Georgia history, surpassed only by Zeier's 3,525 yards in 1993. 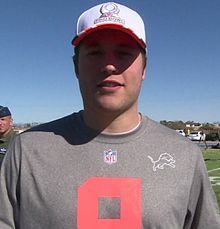 Already after the 2008 NFL Draft, several NFL analysts predicted Stafford would be the #1 pick in the 2009 NFL Draft if he chose to leave school early. He eventually did, and on April 24, 2009, agreed to record contract terms with the Detroit Lions to become the first overall pick of the 2009 NFL Draft, one day before the draft was held. The six-year contract reportedly contained $41.7 million in guaranteed money (the most guaranteed to any player in NFL history until July 30, 2010, when quarterback Sam Bradford signed a deal with $50 million guaranteed) and carried a total value of up to $78 million. Stafford at Lions training camp in 2009. 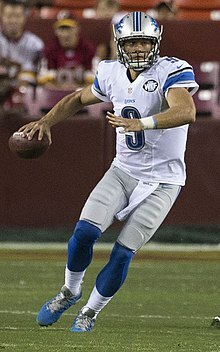 On September 6, 2009, Lions head coach Jim Schwartz announced that Stafford would be the Lions' permanent starting quarterback heading into the 2009 season. Regarding his decision, Schwartz stated, "This isn't an internship or an experiment." Stafford beat out veteran Daunte Culpepper for the starting job. Stafford made his first start in the NFL on September 13, 2009. He was one of four rookie starters for the Lions (Brandon Pettigrew, Louis Delmas, and Sammie Hill) in the season opener against the New Orleans Saints, and was the first Lions rookie quarterback to start the season since Greg Landry in 1968. He completed 16 of 37 passes for 205 yards and 3 interceptions; he was intercepted twice by Darren Sharper, the other time by Scott Shanle. He also ran in a 1-yard touchdown. On November 22, 2009, Stafford threw five touchdowns in a 38–37 win over the Cleveland Browns, becoming the youngest quarterback ever to do so, being more than a year younger than the former record holder, Dan Marino. In a thrilling ending, Stafford received high acclaim when he stepped back onto the field despite team doctors' urge to stay on the sideline after suffering a separated shoulder on the previous play and threw the final touchdown pass as time expired. In addition to the five touchdown passes, Stafford accumulated 422 yards passing, a record for a rookie at that time. For his performance, Stafford won NFC Offensive Player of the Week and Pepsi Rookie of the Week. Stafford was mic'd up for the game for NFL Films. The show's creator Steve Sabol said it was the most dramatic performance he's seen in the show's 30-year history. To begin Week 12 on Thanksgiving Day, Stafford went 20 of 43 for 213 yards with a touchdown pass but threw 4 interceptions in the 34–12 loss against the Green Bay Packers. In Week 13, Stafford went 11-of-26 for 143 yards with a touchdown but threw 2 interceptions in the 23–13 loss at the Cincinnati Bengals. Stafford was placed on injured reserve on December 24 for the minor knee injury. Stafford concluded his rookie season having passed for 2,267 yards, 13 touchdowns, and 20 interceptions. In all 10 of the games he started for the Lions, he either threw or ran for a touchdown despite the Lions finishing the season 2–8 in games that he started in. The Lions did not win another game without Stafford and finished with a 2–14 record overall. Stafford with the Lions in 2010. After throwing for 83 yards in the first half, Stafford injured his right shoulder in the season opener against the Chicago Bears on September 12. Stafford returned on October 31 against the Washington Redskins and threw 4 touchdowns to lead the Lions to a 37–25 win. On November 7, Stafford re-injured his right shoulder in the fourth quarter of the Lions 23–20 OT loss to the New York Jets after throwing for 240 yards, 2 touchdowns, and a rushing touchdown. The Lions announced that Dr. James Andrews had performed surgery on Stafford's throwing shoulder, which included an AC joint repair and a clavicle shaving. The surgery ended his 2010 season, leaving the Lions at 1–2 in games he started and bringing his career total with the Lions to 3–10. The Lions finished out the 2010 season with a 6–10 record and missed the playoffs. The Lions opened the season on September 11 against the Tampa Bay Buccaneers with high expectations. Stafford played well, throwing for 305 yards, three touchdowns, and an interception in a 27–20 win, the first season opener the Lions had won since 2007. Another strong performance followed, with Stafford throwing for four touchdowns, 294 yards, and an interception against the Kansas City Chiefs in Week 2, leading the Lions to a 48–3 blowout victory, the largest win margin in team history. Stafford won the FedEx Air NFL Player of the Week for his performance. In Weeks 3 and 4, Stafford led the team to consecutive comeback victories, a 26–23 overtime comeback victory over the Minnesota Vikings after trailing 20–0 at halftime in Week 3, and a 34–30 win over the Dallas Cowboys after trailing 27–3 with 12:27 left in the 3rd quarter. Week 5 saw Stafford orchestrate a 24–13 win over the Chicago Bears, going 19 of 26 for 219 yards and 2 touchdowns. This marked the first time the Lions had gone 5–0 since 1956, the year before they won their last NFL Championship. In Week 10 against the Bears, Stafford threw four interceptions, including two that were returned for touchdowns on consecutive drives. The game was marred by a brawl that began when Stafford threw Bears cornerback D.J. Moore to the ground by his helmet during a block on an interception return. In response, Moore attacked Stafford and a sideline-clearing brawl ensued. Stafford was fined $7500 for his role in the brawl. On January 1, 2012, Stafford became the fourth quarterback in NFL history and third in the 2011 season, along with Tom Brady and Drew Brees, to throw for 5,000 passing yards in a season after collecting 520 passing yards against the Green Bay Packers in a 45–41 loss in Week 17. (In this game, Stafford threw an interception on an attempted 37-yd touchdown pass that, had he been successful, he would've broken Norm Van Brocklin's record for most yards in a game.) The accomplishment made Stafford the second-youngest quarterback in NFL history to reach 5,000 yards, behind only Dan Marino. Over the last four games of the 2011 regular season, Stafford became the only quarterback in NFL history to pass for over 1,500 yards (1,511) and 14 touchdowns over a four-game span. Stafford and the Lions finished the regular season with a 10–6 record, good enough for the Lions to make their first playoff appearance since 1999. During the Wild Card Round in the playoffs against the New Orleans Saints, Stafford threw for 380 yards with 3 touchdown passes and 1 rushing touchdown. But he also threw two late picks in the fourth quarter that sealed the loss for the Lions, as they were defeated, 45–28. Stafford was named a Pro Bowl alternate for the NFC after the 2011 NFL season. He was later named the 2011 Pro Football Weekly Comeback Player of the Year, AP Comeback Player of the Year, and NFL Alumni Quarterback of the Year. He was ranked 41st by his fellow players on the NFL Top 100 Players of 2012. While the 2011 season proved to be the best season of Stafford's young career, 2012 was one full of setbacks. During the opening game against the St. Louis Rams, Stafford threw 3 interceptions and only 1 touchdown pass. However, the Lions did find a way to win the game 27–23. Stafford and the Lions lost the next three games to the 49ers, Titans, and Vikings. In the ensuing weeks, the Lions managed to win three games, including impressive comeback wins against the Seahawks and Eagles, and a dominating performance against the Jaguars. These proved to be the final winning games of the 2012 season as they ended the season with an eight-game losing streak and with a 4–12 record. Stafford finished the season with 20 touchdown passes, a huge drop compared to the 41 he threw in 2011; 17 interceptions, one more than 2011, and second most in his career since his rookie season; 4,967 passing yards on 727 attempts (an NFL record; the previous record was 691 by Drew Bledsoe); and a QB rating of 79.8, the lowest since his rookie season. He also rushed for a career-high 126 yards and 4 touchdowns. He was ranked #76 among his fellow players on the NFL Top 100 Players of 2013. On July 7, 2013, Stafford agreed to a 3-year, $53 million extension with the Lions. He was guaranteed $41.5 million through 2017. Stafford completed 23-of-35 passes for 242 yards, one touchdown, and one interception on September 29 in a 40–32 win against the Chicago Bears. That gave him 14,069 yards through 49 games, surpassing Kurt Warner (13,864) for the best 50-game start to a career. "I might (reflect on that) when I'm done playing someday," Stafford said. "I had no idea about that, or that it was coming. It's something that I'll probably look back on when I'm done and realize it was something pretty special." Stafford set a record for completions over 50 games at 1,214, over Marc Bulger's 1,115. He's second in career 300-yard passing performances through 50 games at 19, trailing Warner's 29. Stafford led the Lions to a 5–3 record entering their mid-season bye. 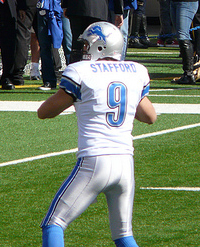 Stafford defeated the Cowboys 31–30 in the final game before the bye, throwing for 488 yards and a touchdown despite two interceptions; down 30–24 with just 62 seconds to work with and no timeouts Stafford completed a 23-yard pass to Calvin Johnson to the Cowboys 1-yard line; he hustled the team to the line as though to spike the ball, but instead jumped over the line for the winning touchdown with 14 seconds to go, to go to 5–3. However, the Detroit Lions would finish 2–6 the rest of the way to finish with a record of 7–9. Lions head coach Jim Schwartz, was later fired following the season. Stafford finished the 2013 season with 4,650 passing yards, with 29 touchdowns and 19 interceptions. He was ranked #100 on the NFL Top 100 Players of 2014 players' list. On January 14, 2014, the Lions announced Jim Caldwell as their new head coach. The Lions rebounded from a disappointing 2013 campaign by finishing with an 11–5 record, thus earning the NFC's 6th seed, their first playoff appearance since 2011. Stafford finished the 2014 season with 4,257 passing yards, with 22 touchdowns and 12 interceptions, and a QB rating of 85.7. On January 4, 2015, Stafford and the Lions went against the Dallas Cowboys, in the Wild Card Round of the playoffs. After the Lions had a 20–7 lead in the third quarter, the Cowboys scored 17 unanswered points to win 24–20. Stafford threw 323 passing yards, one touchdown, and one interception during the game. On January 19, 2015, it was announced that Stafford was selected to the 2015 Pro Bowl, his first Pro Bowl appearance. He would be replacing Peyton Manning of the Denver Broncos, due to a quad injury. For the game, he was named Pro Bowl Offensive MVP, with 316 passing yards, two touchdowns, and one interception. On December 13, 2015, Stafford reached 25,000 passing yards in his 90th career game, becoming the fastest quarterback to reach this milestone, surpassing the previous record held by Dan Marino of 92 games. On December 21, Stafford posted a single-game career high in passer rating, and broke Jon Kitna's single-game franchise record with an 88.0 completion percentage. He completed 22 of 25 passes for 254 yards and three touchdowns in a Week 15 35–27 win over the New Orleans Saints. Stafford became the first quarterback in NFL history to complete 60 percent or more of his passes in all 16 games. Despite Stafford's success, the Lions finished with a 7–9 record and missed the playoffs. Stafford started the 2016 season off with a strong performance against the Indianapolis Colts. In the 39–35 victory, he finished with 340 passing yards and three touchdowns. The Lions followed that up with three consecutive losses before getting a narrow 24–23 win over the Philadelphia Eagles to have a 2–3 record. In the win over the Eagles, Stafford was 19-of-25 for 180 yards and three touchdowns. In the next game, against the Los Angeles Rams, he had 270 passing yards and four touchdowns in the 31–28 victory. On December 11, 2016, Stafford broke Peyton Manning's NFL record of most fourth quarter comebacks in a season with eight. In his career, he has 25 such victories, the most in the NFL since he made his debut in 2009. Stafford got the Lions to a 9–4 start but he suffered a hand injury in week 14 and lost the last three games of the season to finish 9–7. They managed to get the sixth seed in the playoffs, only to lose to the Seattle Seahawks 26–6 in the Wild Card Round. Stafford ended the season with 4,327 passing yards, 24 touchdowns and 10 interceptions — his sixth consecutive season with at least 4,000 passing yards. He also reached the 30,000 career passing yards milestone. He was ranked 31st by his peers on the NFL Top 100 Players of 2017. On August 28, 2017, Stafford signed a 5-year, $135 million extension with $92 million guaranteed, making him the highest-paid player in NFL history at the time. On September 10, in Week 1 against the Arizona Cardinals, Stafford finished with 292 passing yards, four touchdowns, and an interception as the Lions rallied and won by a score of 35–23. It was his 27th fourth quarter or overtime comeback since 2011, the most in the league. In Week 2, on Monday Night Football, Stafford threw his 193rd career touchdown pass in a win over the New York Giants, passing Bob Griese for 48th on the all time touchdown pass list. On October 29, in Week 8 against the Pittsburgh Steelers, Stafford became the only player in NFL history to throw for more than 400 yards and no touchdowns in two different games. On November 6, in Week 9 against the Green Bay Packers, Stafford recorded his 200th career touchdown in the first quarter of the game, becoming the fourth quarterback in NFL history to do so before the age of 30, a list also occupied by Brett Favre, Dan Marino, and Peyton Manning. During Week 13 against the Baltimore Ravens, Stafford had 292 passing yards, a touchdown, and an interception until leaving the game with a bruised right hand. The Lions lost 20–44. On December 31, in Week 17 against the Green Bay Packers, Stafford recorded his 3,000th career completion in his 125th career game, becoming the fastest player to reach the milestone in NFL history. The Lions finished with a 9–7 record, which did not qualify for the playoffs. Stafford ended the season with 4,446 passing yards, 29 touchdowns, and 10 interceptions — his seventh consecutive season with at least 4,000 passing yards. He led the NFC in passing yards in 2017. He was voted 31st by his peers on the list of the Top 100 NFL Players of 2018. Going into the 2018 season, Stafford had a new head coach in Matt Patricia. On Monday Night Football on September 10 against the New York Jets, his season opener, Stafford tied a career-high four interceptions and the Lions lost the game by a score of 48–17. He rebounded statistically in the following game, a 30–27 loss to the San Francisco 49ers, with 347 yards and three touchdowns. The Lions got their first win of the season in the following game against the New England Patriots as Stafford recorded 262 yards, two touchdowns, and one interception in the 26–10 win. Overall, the rest of the season was inconsistent for Stafford and the Lions. He never passed for more than two touchdowns in any game for the rest of the season as the Lions finished with a 6–10 record. One memorable game for the Lions was a 31–0 shutout of their rival, the Green Bay Packers, with Stafford passing for 266 yards and two touchdowns in Week 17. Overall, Stafford finished with 3,777 yards, 21 touchdowns, and 11 interceptions. At Georgia, Stafford met cheerleader Kelly Hall, the sister of former NFL player Chad Hall. They were married on April 4, 2015. In November 2016, the couple announced they were expecting identical twin girls. The twins were born in 2017. Their third daughter was born in 2018. On April 3, 2019, Kelly Stafford posted on Instagram, and asked for prayers, revealing she's planning to undergo surgery for a recently diagnosed brain tumor. Stafford has a weekly segment on Mondays on The Mitch Albom Show with Mitch Albom on Detroit radio station WJR. ^ "Matthew Stafford NFL Football Statistics". Pro-Football-Reference.com. Sports Reference. Retrieved October 15, 2015. ^ Davis, Todd. "Highland Park Grads Now Highest Paid in NFL, MLB". NBC 5 Dallas-Fort Worth. Retrieved January 7, 2018. ^ "Schedule – Highland Park Scots 2005 Football (Dallas, TX)". www.maxpreps.com. Retrieved December 11, 2018. ^ "Pro-style quarterbacks 2006". Rivals.com. January 31, 2006. ^ Tom Kowalski (January 29, 2009). "ESPN's Mel Kiper lauded Matthew Stafford as a high school QB, so he won't bail on him now". ^ "Western Kentucky at Georgia Box Score, September 2, 2006". College Football at Sports-Reference.com. Retrieved January 7, 2018. ^ "Georgia at South Carolina Box Score, September 9, 2006". College Football at Sports-Reference.com. Retrieved January 7, 2018. ^ "UAB at Georgia Box Score, September 16, 2006". College Football at Sports-Reference.com. Retrieved January 7, 2018. ^ "2006 Georgia Bulldogs Schedule and Results". College Football at Sports-Reference.com. Retrieved January 28, 2018. ^ "Tennessee at Georgia Box Score, October 7, 2006". College Football at Sports-Reference.com. Retrieved January 28, 2018. ^ "Vanderbilt at Georgia Box Score, October 14, 2006". College Football at Sports-Reference.com. Retrieved January 28, 2018. ^ "Mississippi State at Georgia Box Score, October 21, 2006". College Football at Sports-Reference.com. Retrieved January 7, 2018. ^ "Georgia at Auburn Box Score, November 11, 2006". College Football at Sports-Reference.com. Retrieved January 7, 2018. ^ "Georgia Tech at Georgia Box Score, November 25, 2006". College Football at Sports-Reference.com. Retrieved January 7, 2018. ^ "Chick-fil-A Bowl – Virginia Tech vs Georgia Box Score, December 30, 2006". College Football at Sports-Reference.com. Retrieved November 14, 2017. ^ "Oklahoma State at Georgia Box Score, September 1, 2007". College Football at Sports-Reference.com. Retrieved January 7, 2018. ^ "Georgia at Alabama Box Score, September 22, 2007". College Football at Sports-Reference.com. Retrieved January 7, 2018. ^ "Georgia vs Florida Box Score, October 27, 2007". College Football at Sports-Reference.com. Retrieved January 7, 2018. ^ "1982 Georgia Bulldogs Football Schedule". Sicemdawgs.com. July 8, 2007. Retrieved December 19, 2010. ^ "1982 Georgia Bulldogs Schedule and Results". College Football at Sports-Reference.com. Retrieved January 28, 2018. ^ "Sugar Bowl – Hawaii vs Georgia Box Score, January 1, 2008". College Football at Sports-Reference.com. Retrieved January 7, 2018. ^ "Matthew Stafford 2007 Game Log". College Football at Sports-Reference.com. Retrieved January 7, 2018. ^ "2007 Georgia Bulldogs Schedule and Results". College Football at Sports-Reference.com. Retrieved January 28, 2018. ^ "Georgia Tech at Georgia Box Score, November 29, 2008". College Football at Sports-Reference.com. Retrieved January 7, 2018. ^ "Georgia Bulldogs Passing". College Football at Sports-Reference.com. Retrieved March 25, 2018. ^ "2008 Southeastern Conference Leaders". College Football at Sports-Reference.com. Retrieved March 25, 2018. ^ "Matthew Stafford 2008 Game Log". College Football at Sports-Reference.com. Retrieved January 7, 2018. ^ "2008 Georgia Bulldogs Schedule and Results". College Football at Sports-Reference.com. Retrieved January 28, 2018. ^ "Capital One Bowl – Michigan State vs Georgia Box Score, January 1, 2009". College Football at Sports-Reference.com. Retrieved January 7, 2018. ^ "Georgia's Stafford, Moreno Enter 2009 NFL Draft". NCAA.com. January 7, 2009. Retrieved January 28, 2018. ^ Pro Football Weekly 2008 All-America Team[permanent dead link]. ^ Wangrin, Mark (January 1, 2009). "Stocco, Badgers Win Capital One Bowl". Washington Post. Retrieved December 11, 2018. ^ "Matthew Stafford". College Football at Sports-Reference.com. Retrieved January 15, 2016. ^ Prisco, Pete (April 28, 2008). "Drafting '09: Georgia QB Stafford starts out as top dog". CBSSports.com. Archived from the original on July 25, 2008. ^ Perloff, Andrew (April 29, 2008). "2009 Mock Draft". CNNSI.com. ^ Clayton, John (April 24, 2009). "Sources: Matthew Stafford agrees to $41.7M, six-year deal with Detroit Lions". ESPN.com. ^ Detroit negotiated a deal with Stafford on April 24, 2008, less than 24 hours before the draft. "Sources: Stafford will be No. 1 pick". ESPN.com. April 24, 2009. Retrieved April 24, 2009. ^ "NFL Events: Combine Top Performers". NFL.com. ^ Pompei, Dan (March 22, 2009). "Georgia's Matthew Stafford stands out with NFL Wonderlic score". Chicago Tribune. Archived from the original on May 1, 2009. ^ "Lions to start No. 1 overall pick Stafford at QB". ESPN.com. September 7, 2009. Retrieved February 23, 2019. ^ "Matthew Stafford named Lions' starting QB; coach Jim Schwartz: this isn't an experiment". ^ Associated Press (September 7, 2009). "Lions to start Stafford at QB". ESPN. ESPN Internet Ventures. Retrieved September 28, 2014. ^ "Watch Detroit Lions vs. New Orleans Saints [09/13/2009] - NFL.com". www.nfl.com. ^ Wywrot, Chrissie (November 24, 2009). "Stafford Named NFC Offensive Player of the Week". Detroit Lions.com. Archived from the original on November 27, 2009. Retrieved November 24, 2009. ^ "QB Matthew Stafford Voted Week 11 Pepsi NFL Rookie of the Week". Archived from the original on December 1, 2009. Retrieved November 27, 2009. ^ "Green Bay Packers at Detroit Lions – November 26th, 2009". Pro-Football-Reference.com. Retrieved January 7, 2018. ^ "Detroit Lions at Cincinnati Bengals – December 6th, 2009". Pro-Football-Reference.com. Retrieved January 7, 2018. ^ a b "Stafford's rookie season ends on IR" ESPN.com. Retrieved December 25, 2009. ^ "2009 Detroit Lions Statistics & Players". Pro-Football-Reference.com. Retrieved January 28, 2018. ^ "Source: Stafford's season likely over". Fox Sports Detroit. November 9, 2010. Retrieved December 19, 2010. ^ "2010 Detroit Lions Statistics & Players". Pro-Football-Reference.com. Retrieved January 28, 2018. ^ "Detroit Lions at Tampa Bay Buccaneers – September 11th, 2011". Pro-Football-Reference.com. Retrieved January 7, 2018. ^ "Kansas City Chiefs at Detroit Lions – September 18th, 2011". Pro-Football-Reference.com. Retrieved January 7, 2018. ^ "Detroit Lions at Minnesota Vikings – September 25th, 2011". Pro-Football-Reference.com. Retrieved January 7, 2018. ^ "Detroit Lions at Dallas Cowboys – October 2nd, 2011". Pro-Football-Reference.com. Retrieved January 7, 2018. ^ "Chicago Bears at Detroit Lions – October 10th, 2011". Pro-Football-Reference.com. Retrieved January 7, 2018. ^ "Detroit Lions at Chicago Bears – November 13th, 2011". Pro-Football-Reference.com. Retrieved January 7, 2018. ^ "Carolina Panthers at Detroit Lions – November 20th, 2011". Pro-Football-Reference.com. Retrieved January 7, 2018. ^ "Detroit Lions at Green Bay Packers – January 1st, 2012". Pro-Football-Reference.com. Retrieved January 7, 2018. ^ "Patriots' Brady now No. 2 on single-season passing list". NFL.com. ^ "2011 Detroit Lions Statistics & Players". Pro-Football-Reference.com. Retrieved January 28, 2018. ^ "Detroit Lions Team Encyclopedia". Pro-Football-Reference.com. Retrieved January 28, 2018. ^ "Wild Card – Detroit Lions at New Orleans Saints – January 7th, 2012". Pro-Football-Reference.com. Retrieved January 7, 2018. ^ "AP Comeback Player of the Year Winners". Pro-Football-Reference.com. Retrieved March 25, 2018. ^ "'Top 100 Players of 2012': Matthew Stafford". NFL.com. Retrieved March 25, 2018. ^ "St. Louis Rams at Detroit Lions – September 9th, 2012". Pro-Football-Reference.com. Retrieved January 7, 2018. ^ "Detroit Lions at San Francisco 49ers – September 16th, 2012". Pro-Football-Reference.com. Retrieved January 28, 2018. ^ "Detroit Lions at Tennessee Titans – September 23rd, 2012". Pro-Football-Reference.com. Retrieved January 28, 2018. ^ "Minnesota Vikings at Detroit Lions – September 30th, 2012". Pro-Football-Reference.com. Retrieved January 28, 2018. ^ "Detroit Lions at Philadelphia Eagles – October 14th, 2012". Pro-Football-Reference.com. Retrieved January 28, 2018. ^ "Seattle Seahawks at Detroit Lions – October 28th, 2012". Pro-Football-Reference.com. Retrieved January 28, 2018. ^ "Detroit Lions at Jacksonville Jaguars – November 4th, 2012". Pro-Football-Reference.com. Retrieved January 28, 2018. ^ "2012 Detroit Lions Statistics & Players". Pro-Football-Reference.com. Retrieved January 7, 2018. ^ "Matthew Stafford 2012 Game Log". Pro-Football-Reference.com. Retrieved January 7, 2018. ^ "'Top 100 Players of 2013': Matthew Stafford". NFL.com. Retrieved March 25, 2018. ^ "Chicago Bears at Detroit Lions – September 29th, 2013". Pro-Football-Reference.com. Retrieved January 7, 2018. ^ Meinke, Kyle (September 29, 2013). "Detroit Lions QB Matthew Stafford off to best 50-game start in NFL history". MLive.com. Retrieved September 29, 2013. ^ "Dallas Cowboys at Detroit Lions – October 27th, 2013". Pro-Football-Reference.com. Retrieved January 7, 2018. ^ "2013 Detroit Lions Statistics & Players". Pro-Football-Reference.com. Retrieved January 28, 2018. ^ "Lions fire coach Jim Schwartz after failing to reach playoffs". USA TODAY. Retrieved January 28, 2018. ^ "Matthew Stafford 2013 Game Log". Pro-Football-Reference.com. Retrieved January 7, 2018. ^ "'Top 100 Players of 2014': Matthew Stafford". NFL.com. Retrieved March 25, 2018. ^ "2014 Detroit Lions Statistics & Players". Pro-Football-Reference.com. Retrieved January 28, 2018. ^ "Matthew Stafford 2014 Game Log". Pro-Football-Reference.com. Retrieved January 7, 2018. ^ "Wild Card – Detroit Lions at Dallas Cowboys – January 4th, 2015". Pro-Football-Reference.com. Retrieved January 7, 2018. ^ "2014 NFL Pro Bowlers". Pro-Football-Reference.com. Retrieved March 25, 2018. ^ "Watch Team Michael Irvin vs. Team Cris Carter [01/25/2015] - NFL.com". www.nfl.com. Retrieved January 28, 2018. ^ "Lions QB Matthew Stafford reaches 25,000 yards passing in 90 games". ESPN. December 13, 2015. Retrieved December 13, 2015. ^ Wesseling, Chris (December 23, 2015). "Streaking Matthew Stafford leads Lions past Saints". NFL.com. Retrieved December 22, 2015. ^ "Matthew Stafford 2015 Game Log". Pro-Football-Reference.com. Retrieved January 7, 2018. ^ "2015 Detroit Lions Statistics & Players". Pro-Football-Reference.com. Retrieved January 28, 2018. ^ "Detroit Lions at Indianapolis Colts – September 11th, 2016". Pro-Football-Reference.com. Retrieved January 28, 2018. ^ "Philadelphia Eagles at Detroit Lions – October 9th, 2016". Pro-Football-Reference.com. Retrieved January 28, 2018. ^ "Los Angeles Rams at Detroit Lions – October 16th, 2016". Pro-Football-Reference.com. Retrieved January 28, 2018. ^ "Trail in fourth quarter? Nothing new for Lions". ESPN.com. November 24, 2016. Retrieved November 24, 2016. ^ "2016 Detroit Lions Statistics & Players". Pro-Football-Reference.com. Retrieved January 7, 2018. ^ "Wild Card – Detroit Lions at Seattle Seahawks – January 7th, 2017". Pro-Football-Reference.com. Retrieved January 7, 2018. ^ "Lions, Matthew Stafford agree to 5-year contract extension; $27 million a year". USA Today. August 28, 2017. Retrieved August 29, 2017. ^ Shook, Nick (August 28, 2017). "Lions, Matthew Stafford agree to $135M extension". NFL.com. ^ Lage, Larry. "Matthew Stafford throws 4 TD passes; Lions rally past Cardinals". WXYZ Detroit. Retrieved September 10, 2017. ^ "Lions prep for Giants with Odell Beckham Jr". Fox Sports. September 17, 2017. Retrieved September 17, 2017. ^ Rothstein, Michael (October 31, 2017). "Matthew Stafford's 400-yard, no-touchdown game? It has happened before". ESPN. Retrieved October 31, 2017. ^ Birkett, Dave (November 6, 2017). "Lions' Matthew Stafford joins exclusive club with 200th career TD pass". Detroit Free Press. Retrieved November 6, 2017. ^ "Matthew Stafford bruises right hand in Lions' loss". NFL. Retrieved December 3, 2017. ^ "2017 NFL Standings & Team Stats". Pro-Football-Reference.com. Retrieved January 28, 2018. ^ Atkins, Nate (December 31, 2017). "Matthew Stafford is the fastest QB in NFL history to 3,000 completions". MLive. Retrieved December 31, 2017. ^ "2017 NFL Passing". Pro-Football-Reference.com. Retrieved January 28, 2018. ^ "'Top 100 Players of 2018': Detroit Lions quarterback Matthew Stafford – No. 31". NFL.com. Retrieved December 11, 2018. ^ "Patriots DC Matt Patricia named head coach of Lions". NFL.com. Retrieved December 11, 2018. ^ Birkett, Dave (September 10, 2018). "Jets 48, Lions 17: Matt Patricia era begins in embarrassing fashion". Detroit Free Press. Retrieved October 8, 2018. ^ "Lions' late rally falls short vs. 49ers". Reuters. September 17, 2018. Retrieved January 22, 2019. ^ "Matt Patricia-led Lions beat Bill Belichick, Patriots 26–10". USA TODAY. Retrieved January 22, 2019. ^ "2018 Detroit Lions Statistics & Players". Pro-Football-Reference.com. Retrieved January 22, 2019. ^ "Matthew Stafford 2018 Game Log". Pro-Football-Reference.com. Retrieved January 22, 2019. ^ "Matthew Stafford-led Detroit Lions blank Aaron Rodgers, Green Bay Packers". UPI. Retrieved January 22, 2019. ^ "Lions 2018 review: Matthew Stafford has to get right again". mlive.com. Retrieved January 22, 2019. ^ "Most passing touchdowns, rookie, game". pro-football-reference.com. Retrieved November 26, 2015. ^ "Most consecutive games 350+ yards". pro-football-reference.com. Retrieved November 26, 2015. ^ a b "NFL Single-Season Pass Attempts Leaders". pro-football-reference.com. Retrieved November 21, 2015. ^ "NFL Career Pass Attempts per Game Leaders". pro-football-reference.com. Retrieved November 26, 2015. ^ "NFL Single-Season Pass Attempts per Game Leaders". pro-football-reference.com. Retrieved November 26, 2015. ^ "Most games 40+ pass attempts, season". Pro-Football-Reference.com. Retrieved November 26, 2015. ^ Lage, Larry (January 3, 2017). "Rodgers-led Packers beat Lions 31–24 to win NFC North". Associated Press. Detroit: AP Sports. Associated Press. Retrieved January 2, 2017. ^ a b c "Detroit Lions Team Encyclopedia - Pro-Football-Reference.com". Pro-Football-Reference.com. ^ "In multiple seasons, from 1950 to 2018, playing for the Detroit Lions, requiring Passing Yds >= 400". www.pro-football-reference.com. Pro Football Reference. Retrieved November 23, 2018. ^ "In multiple seasons, from 1950 to 2018, playing for the Detroit Lions, requiring Passing Yds >= 300". www.pro-football-reference.com. Pro Football Reference. Retrieved November 23, 2018. ^ Patra, Kevin (December 4, 2016). "Stafford saves heroics for another day in Lions win". nfl.com. Retrieved December 5, 2016. ^ "Matthew Stafford is getting married". FabWags. August 16, 2014. Retrieved September 11, 2014. ^ "It's twins for Lions QB Stafford, wife Kelly". Detroit Free Press. November 11, 2016. Retrieved November 22, 2016. ^ "NFL Star Matthew Stafford, Wife Kelly Welcome Twins". US Magazine. April 11, 2017. Retrieved August 11, 2017. ^ "News/Talk 760 WJR". Wjr.com. Archived from the original on December 22, 2010. Retrieved December 19, 2010. Wikimedia Commons has media related to Matthew Stafford.